Where does all the time go? Despite the burgeoning army of machines designed to save us time – from cars and aeroplanes to dishwashers and microwaves – we don't seem to have any more of it on our hands. We simply fill the space we clear with more things to do – consuming more, spending more – and then look around for new ways of saving time. And so we spiral onwards, upwards, ever faster. Being busy has become a habit, and a habit that gives us high status – busy people are important people. The business of business is busy-ness. We are moving from a world in which the big eats the small, to a world where the fast eats the slow. But the fallout from a society hooked on speed is everywhere. It's affecting our health: 60 per cent of the adult population in the UK report that they suffer from stress, and more than half of these say that this has worsened over the last 12 months. It's affecting our family life, with a quarter of British families sharing a meal together only once a month. And it affects our environment too: air travel is a major source of carbon dioxide emissions, accelerating climate change as we speed around the world. And the faster we live, the faster we consume, the faster we waste energy and the faster we pollute the planet. The faster we seem to be running out of time. Is there something fundamentally wrong with the structure and values of this high-speed society? What are we running from and what are we running towards? Sustainable development is all about time. It's about trying to safeguard the health of the planet, and the people it supports, indefinitely, unconstrained by time. The idea of time offers a novel perspective on what sustainable development is all about. Looking at issues affecting society and the environment through the prism of time conveys the urgency of the challenge and leads us to solutions we might not have thought of before. 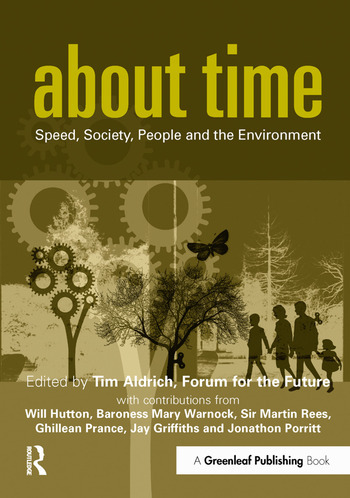 About Time, edited by the think-tank Forum for the Future, brings together ten of the world's leading thinkers and writers, including Will Hutton, Baroness Mary Warnock, Sir Martin Rees, Ghillean Prance, Jay Griffiths (the author of the bestselling Pip Pip) and Jonathon Porritt, from disciplines including biology, business, sociology, ethnography, astronomy, philosophy, politics, history and sustainability in a collection of intriguing essays exploring the issue of time and how it relates to the environment, economy and society. The first half of this collection looks at different dimensions of time – from the history of time as a social phenomenon and cultural notions of time, to cosmological time and the difference between human and machine time. These "think-pieces" are followed by a series of more practical, solutions-oriented contributions, looking at how we deal with time in different contexts – from the slow food movement and time banks to long-term thinking in politics and what we can individually do to cope with the speed society. Contributions are liberally interspersed with boxes and brief pieces offering bite-sized facts, figures and insights relating to time and our everyday lives. About Time is a high-profile collection aimed at creating debate about where the values of our contemporary society are taking us. It will foster reflective thinking about different aspects of time, using the concept of time to communicate and illuminate the idea of sustainable development and question our idolatry of speed. In doing so, it aims to inspire and help decision-makers in business, government and elsewhere to appreciate the challenges of sustainable development, and inspire individuals to create change in their own lives. For readers of No Logo and Longitude, this book provides a thought-provoking twist, bringing together time and sustainability in a refreshing, provocative and accessible way.